Heat the skillet or grill and add the peppers to cook, flipping constantly for 5 minutes. Now season the meat with salt and pepper to taste. Cook alongside the peppers until they're browned outside and are cooked medium inside, so they don't dry. Let cool a few minutes. In the meantime, prepare the yogurt cream and blue cheese by mixing all of the ingredients with a food until it's a soft purée. Pour into a jar. Once the meat and peppers are cooked, put together the salad. 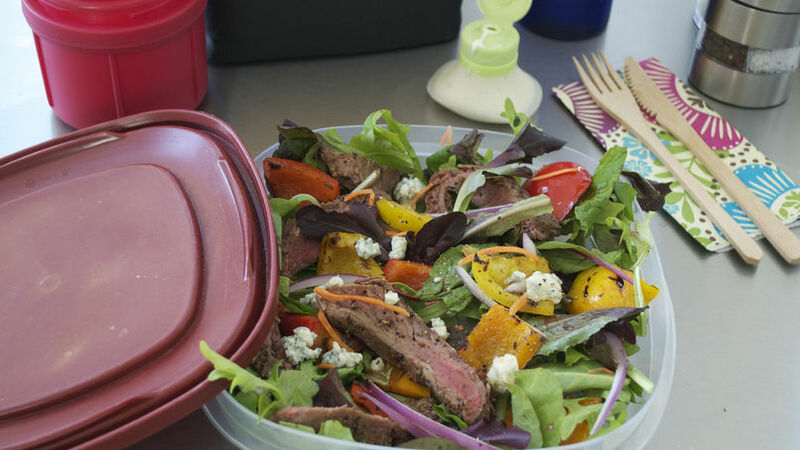 Use a packable lunch container with a lid. Add a bed of spring mix; distribute the peppers, the shredded carrot, the strips of onion and the blue cheese crumbles. Mix in the meat. Keep the yogurt-dressing aside to add to the salad when ready to eat. Keep the salad refrigerated so the greens stay fresh. Add the dressing when you're ready to eat. Add small, sweet tomatoes if you like. Eating out from time to time is really great, fun, but it can get expensive. My husband works far and doesn't have enough time to come home for lunch. Eating at restaurants everyday isn't financially efficient and is nowhere near as good as a homemade meal made with love and delicious ingredients. I prepare his lunchbox for work like I do for my youngest daughter for school. If you've got leftovers from the night before, you can give them a creative twist to create a new dish to take with them. You can also prepare something fresh and easily enjoyed in an office. On Sundays we usually grill at home. When we have leftover meat I cut it into strips and put it away to make a delicious salad with different greens, meat, yogurt and blue cheese for my husbands lunch. Give it I try. It's convenient, nutritious and it's perfect for work.